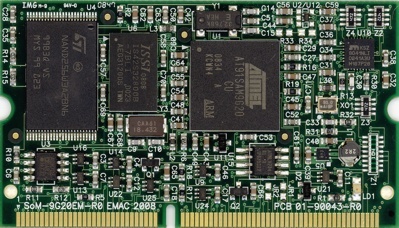 SoM-iMX6M System on Module | EMAC Inc. Designed and manufactured in the USA the SoM-9G20M is an ARM System-on-Module (SOM) based on the Atmel ARM9 AT91SAM9G20 processor. Designed and manufactured in the USA the SoM-9260M is an ARM System-on-Module (SOM) based on the Atmel ARM9 AT91SAM9260 processor. 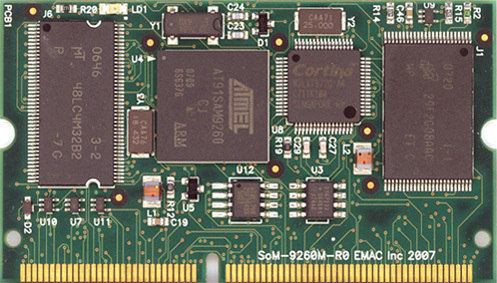 The SoM-3517M is an ARM System on Module (SoM) based on the TI ARM Cortex-A8 processor. 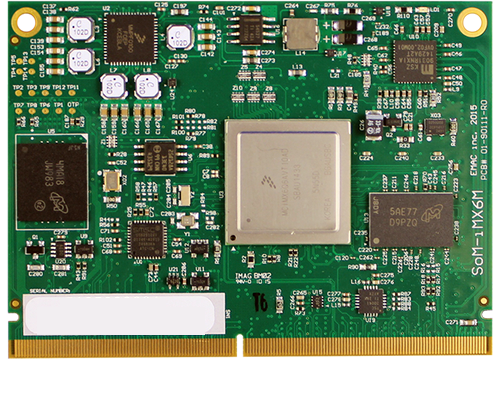 Designed and manufactured in the USA this fanless ARM Cortex, 600 MHz SoM has an Ethernet PHY included along with 4 serial ports. It utilizes up to 512MB of external DDR2 RAM, UP to 1GB of NAND Flash, up to 4GB of eMMC Flash. 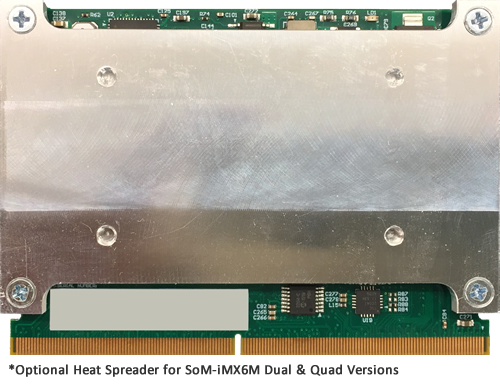 The SoM-iMX6 is an ARM System on Module (SoM) based on the NXP (Freescale) i.MX 6 ARM Cortex A9 Solo, Dual or Quad Core processor. Hardware Video encoding on Dual or Quad CPU supporting u pto 1080p x 30fps at 20Mbps encoding of video. 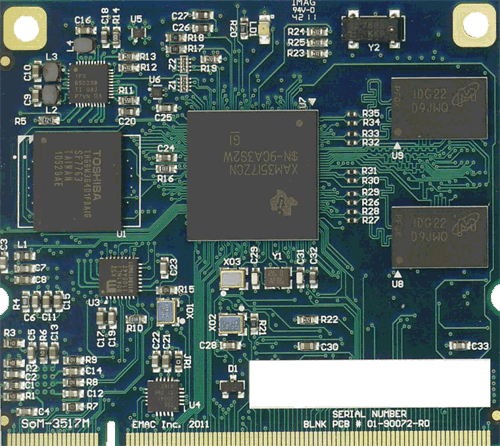 The SoM-iMX6 is a System on Module (SoM) based on the Freescale iMX.6 Cortex A9 Single, Dual or Quad Core processor. Designed and manufactured in the USA, this wide temperature, fanless ARM 1GHz SoM has 10/100/1000 BaseT Ethernet included along with 4 serial ports. It utilizes up to 4GB of eMMC Flash, up to 16MB of serial data flash, and up to 1GB of LP DDR2 RAM. A SoM is a small embedded module that contains the core of a microprocessor system. Hardware Video encoding on Dual or Quad CPU supporting upto 1080px 30fps at 20Mbps encoding of video. EMAC can build the SoM-iMX6M System on Module with any option mix you require. Build-To-Order can offer a significant cost savings when only a certain subset of options are needed! 25 piece minimum required.